Robert Reich has been a contrarian about most of the Obama economic policies, but that does not necessarily make him a negative person. In fact he is as jocular as a short skinny man can be, focusing his biting wit first on himself; then on others. He deserves a lot of slack when he critiques policies because at heart he is an optimist and when there are reasons to cheer, he’ll be among the first. How can you tell when someone is a “doomsayer” or someone with a clear vision in contrast to conventional wisdom? When it comes to advocating trickle-down economics, he’ll say that a Democrat who advocates it is someone who is most likely abandoning the traditional constituents of the party. This means that Democrats are walking away from almost everyone except the very wealthy and the extreme social conservatives. This is not your father’s Democrat; certainly not your grandfather’s, which included embracing FDR’s New Deal. Recently, the Obama administration has been justifiably touting some positive economic numbers. Corporate profits are up; the stock-market has soared since the Obama inauguration, companies such as General Motors that were bailed out are now profiting and repaying their loans from the government with interest. The Bureau of Labor Statistics reports 192,000 new jobs in February (220,000 new jobs in the private sector and a drop in government employment), and a drop in the overall unemployment rate from 9 to 8.9 percent. s created since February 2010 (about 1.26 million) pay significantly lower wages than the jobs lost (8.4 million) between January 2008 and February 2010. In other words, the big news is not jobs as some would want us to believe. It’s wages. We work for basically two reasons: (a) a way of gaining personal fulfillment, and (b) accruing income that allows us to purchase necessities, and if possible, some discretionary items. Whether an individual makes the federal minimum wage of $7.25 / hour or $5,000 / hour as some hedge fund managers do, he or she is still counted as employed. Structural changes make the situation worse. 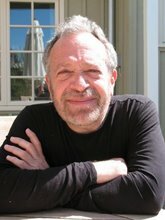 Reich points out, “Millions of private-sector workers have been fired and then re-hired as contract workers to do almost exactly what they were doing before, but without any benefits or job security.” When combined with the outsourcing that has taken place since 1973, it’s no small wonder that the American worker’s worries do not end with whether or not they are employed, but at what wage. Current American capitalism means that we have high unemployment with low wages which forces more and more consumers to shop at the likes of the Dollar Store. If we had lower unemployment with high wages, consumers could more readily afford Target, Macy’s, or even more expensive stores such as Needless Mark-up (or something like that). In his blog, Reich repeatedly points out that the most secure jobs are those in the public sector. They cannot be outsourced and wages at least keep up with inflation. 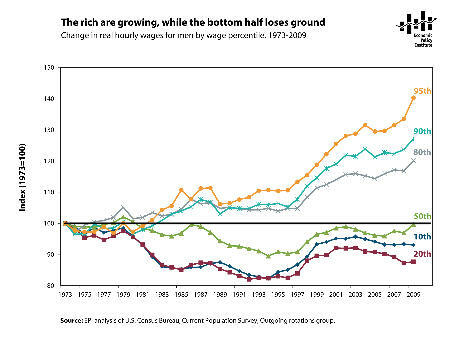 At least that’s the way it was before Scott Walker’s Wisconsin and the vision that he any most Republicans have of the American economy. As we give kudos to the Obama administration for beginning to reverse declining employment trends, we need to keep the pressure on to ensure that the jobs that are created are ones that pay decent wages. As is so often the case, when this administration gets to an intersection, it tends to look right before crossing. We need to do more to ensure that it looks both ways. Previous Post:High-speed rail: fast-track or slow-down?